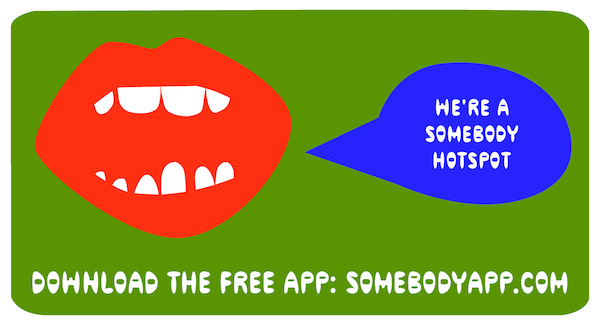 Somebody, a new messaging service developed by filmmaker, artist, and writer Miranda July, debuts today. The app is a new way to communicate: rather than connecting directly with another person, Somebody helps mediate interaction by introducing a third party to the mix. It works like this: when a message is sent from person A to person B via Somebody, person A’s message is sent to person C, who then delivers it—in any way she wants, whether that be via verbal communication, performance, or an act of her own choosing—to person B. Created with support from Miu Miu, Somebody is available for free in the iTunes Store. LACMA is one of the official hotspots for Somebody. (Other hotspots include the New Museum, New York; Yerba Buena Center for the Arts, San Francisco; Portland Institute of Contemporary Art; Boston Museum of Fine Art; Walker Art Center, Minneapolis; and Museo Jumex, Mexico City.) At the intersection of many elements that make up a large metropolis—major modes of public transportation, streets/intersections, business centers, and individual perspectives—LACMA serves as a fitting hub for spontaneous interaction and experiences through Somebody. LACMA chatted with July about the app and how she imagines it will be used. 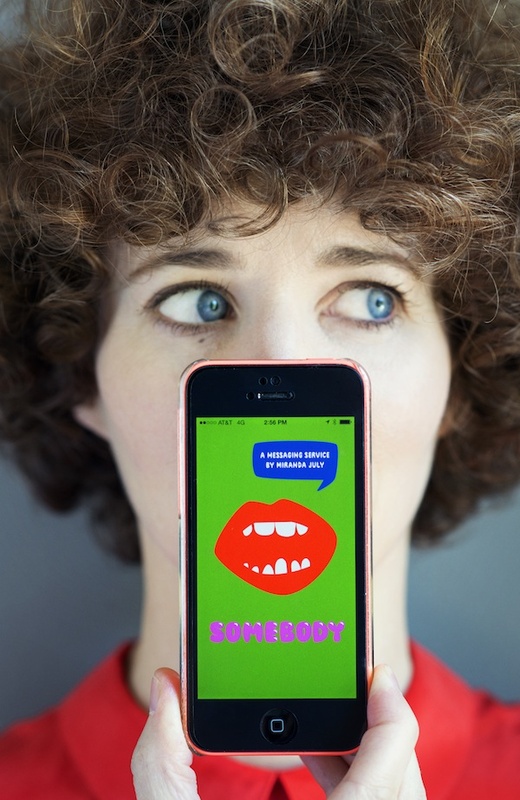 Miranda July will be at LACMA’s Art + Technology Lab on Thursday, September 11, to talk more about Somebody. LACMA: How did you come up with the concept for project? What came first, the idea, the film, the app, or did they all intersect at once? Miranda July: I had the idea for the app about three weeks before Miu Miu contacted me about making a short movie. It was originally called “Proxy”—I think every app is called Proxy to begin with. The idea really electrified me; I felt oddly determined to make it, even though barely know what an app is and certainly didn’t have the money lying around to pay for it. When the invitation came from Miu Miu I didn’t immediately connect it to the app—I just thought it would be a good way to get my head back in to directing after writing a novel for the last few years. My first idea was something about adults giving birth to other adults. My husband’s reaction to that idea was, “Hmmm, you should do something more democratic—like your We Think Alone project.” I said harumph and went to brush my teeth. Five minutes later I had it all worked out: the movie about the app, pitching the actual app to Miu Miu. I emailed the idea the next day to Miuccia Prada and her right-hand woman, Verde Visconti, and they completely got it immediately. And they respected that the app was mine, that they were supporting my work in this very organic way. The movie I wrote created a world for both the Miu Miu clothes and the app, it all felt very natural. That was in April I think—so I’ve spent the last five months making the app and movie simultaneously. LACMA: How has the evolution of your work been informed by developments in technology? MJ: I never mean to make work about or with technology, it just keeps happening—probably a lot of artists and writers can say the same. I’m old enough to feel the newness and strangeness of the technology, but no so old as to be able to see outside it clearly. So it’s interesting, like a dream I can’t wake up from, like “When’s life going to get back to normal like it was when I was a kid?” I also feel some kind of responsibility to poke back at this stuff that so completely impacts every second of my life. LACMA: What’s the significance of the hotspots, and how might the location inform how the app is used? Why did you pick cultural institutions to be the hotspots? MJ: From the start I knew it would be almost impossible to get enough users for Somebody to really work the way it does in the movie—with strangers delivering messages on the street and in restaurants. I mean it might work like that eventually in like one block in Silver Lake or in Portland, but mostly I think friends will use it amongst each other, at parties, colleges, workplaces. The way to make it work in public was obviously to go to where the people already are gathered. Initially I was focused on festivals and concerts—sporting events! Then I realized museums made more sense because they are already focused on inviting an engaged audience inside; this is an ongoing part of their job. Somebody fit very easily in to conversations curators were already having about interactive art, digital art, performance. LACMA: We’re in Los Angeles, so we have to ask, can you imagine someone being “discovered” by this app? MJ: Sure. Even though Somebody is designed to create fleeting, undocumented experiences in real life, I imagine people (myself included) will be tempted to video message deliveries. So it is likely that there will be many little scripted performances popping up online—written by one person and performed by another. Someone could be discovered for either their writing or their incredible performance. But there are already so many ways to be discovered, Somebody is probably better for something else. 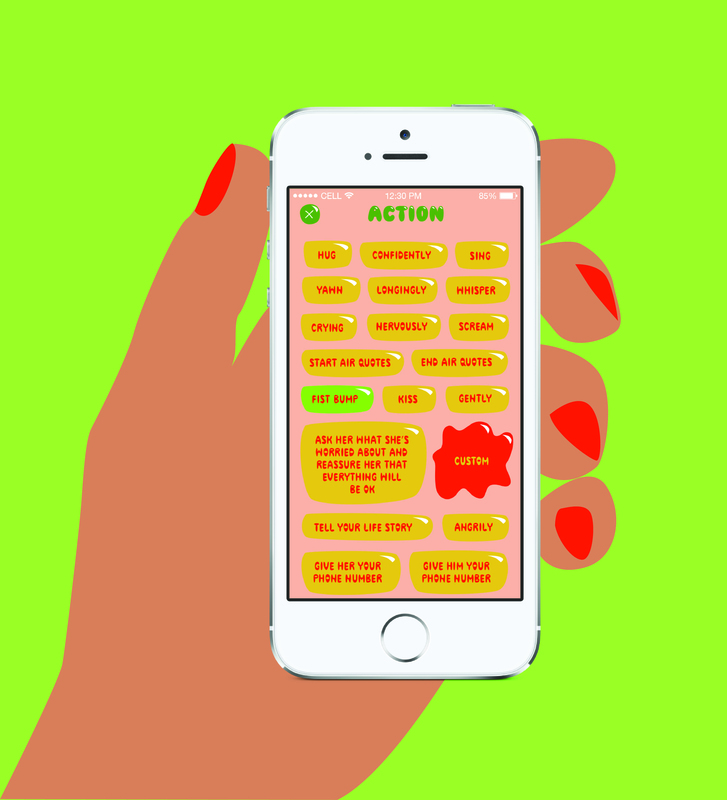 LACMA: Tell us an imagined scenario that would take place at LACMA and mediated by the Somebody app. MJ: Well, the nice thing is you don’t have to raise your hand in public or do anything that calls attention to yourself—so if a museumgoer wants to use Somebody, she might quietly write a message to her friend, who is right there beside her, and covertly choose a stand-in to deliver it. Then, with any luck, a few minutes later a stranger will walk up to her friend and perform . . . a confession of love? 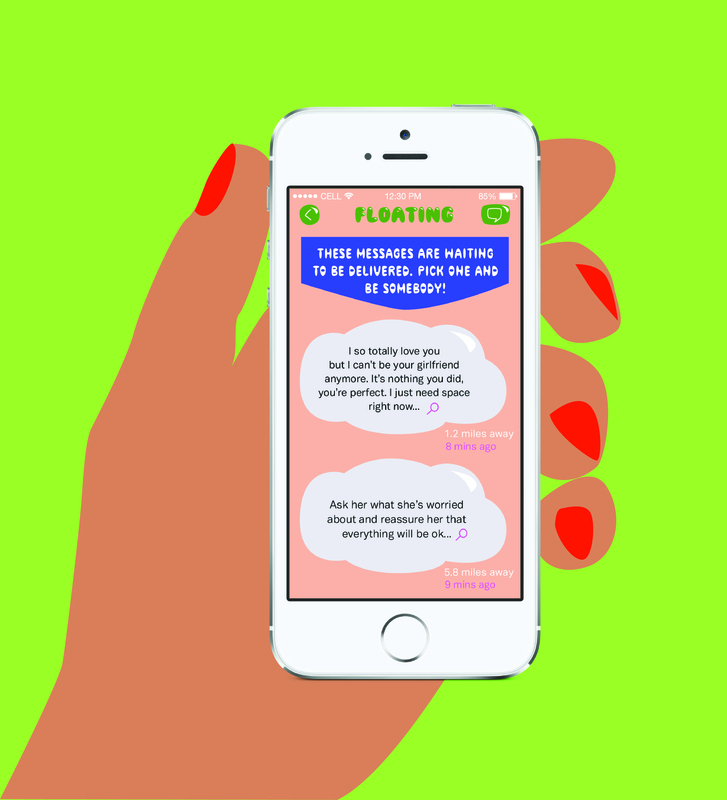 Or these friends might be feeling daring and start browsing the “floating messages” to look for one nearby. They see a message that asks them to buy someone a cup of coffee (you can add actions to your messages). They accept the mission and find the recipient and buy him a cup of coffee and he ends up becoming part of their polyamorous lifestyle. Or just enjoys the surprise and the cup of coffee—the message was from his wife in Atlanta who misses him.